This may be a little late to be posting this, but never the less here is the coverage if the Gears of War 3 Midnight Madness Event at Gamestop where it was sponsored by GamingBolt.com and Calibur 11. As I am sure most of you know, many Gamestops and other retailers held Tournaments where they were playing Gears of War 3 before the actual midnight release of the game. Unfortunately, Epic Games had never officially gave the OK to every retailer to be able to open an early copy for a Tournament. Our local Gamestop happened to be one of them, hence the reason the Tournament is being played on Gears of War 2 with no title updates. Everyone at the event still had a blast whether they were inside playing in the Tournament or waiting outside in the cold as they peered in at the red glow of the Calibur 11 Vault being played on, as Midnight could not come sooner so everyone could rush home with their specific editions of Gears of War 3 to tear open. We gave little Damien another shot at winning the Tournament as we could not resist, as the 1st prize winner got a copy of Gears of War 3 and an exclusive Berserker Shirt only sold by Calibur 11. I’m sure you can tell the difference when our professional camera man is working the camera and when I am, as I am not the best at it, especially at the end considering I was pointing at the Calibur 11 logo on the shirt when I mentioned who makes the Vaults… which you obviously can’t see. Huge thanks to Calibur 11 for letting us hold the giveaway that night as well as Tritton and Epic Games for making our Gears of War Giveaway Month so successful. Also another big thanks to David Bressman for your help, as the Midnight Madness coverage wouldn’t have been made possible without him. 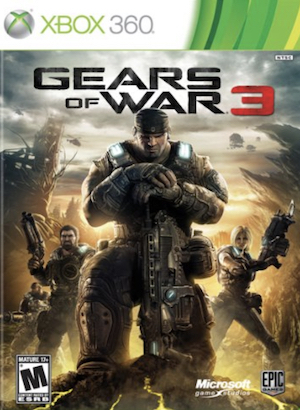 Read our Gears of War 3 Review and check out our unboxing/feature of the Gears of War Vault here. You can also read our review of one killer pair of headsets that any Gears of War fan will appreciate, the Tritton Dobly 7.1 Gears of War 3 Headset Review. Although our contest is over you can still grab the Vault, the Berseker Shirt and more at Calibur11.com. Also if you entered into the contest without winning anything, you may still have an opportunity as some of the winners have not replied yet, in which case we will randomly choose other entrants.